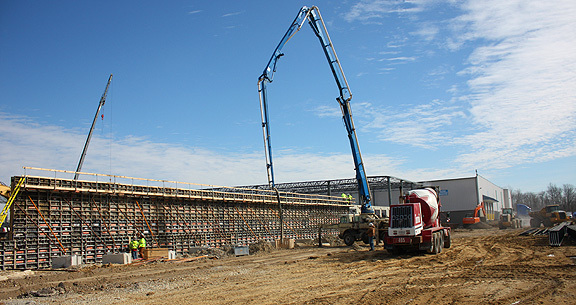 Project obstacles and solutions: Fastenal Corporation made plans to build a new distribution center and warehouse in Indianapolis. The design called for poured concrete walls. Custom Concrete was hired to do all of the wall pours, foundations and floors. Custom Concrete needed a concrete wall mix that would give them a smooth, architectural finish. The walls were designed to be exposed concrete, so it was critical that they had a finished product when the forms came down. The mix needed to be flowable and self-consolidating. Since they had built 9' blockouts in the wall forms, the concrete had to fill all the voids around each of the blockouts without leaving any gaps. That included flowing under the knockout forms. Another obstacle had to do with the cold temperature and set times. To keep this project on schedule, it needed to be poured during very cold winter temperatures. IMI supplied 165 yards of imix 180 self-consolidating concrete for the walls. It is designed with a high cementitous content that provides very early strength and is especially effective for getting concrete to set in cold weather. Normal concrete set times would have taken days before the forms could be removed. With imix 180, 4,000 psi was achieved in 48 hours or less and the forms came off the walls in 1-2 days. For more information on pouring walls with imix 180, click here.